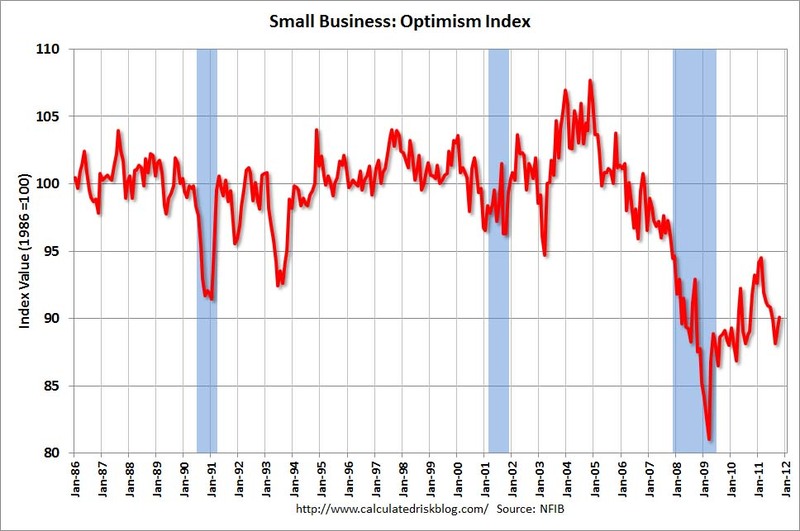 The National Federation of Independent Business reported that its Index of Small Business Optimism shows that small businesses are a bit more optimistic about the American economy in October, but are still weighed down by negative owner sentiment. The index score is based on a point scale with 100 signifying the standard good year, or the economic conditions of 1986. A typical recession index is about 90 before it jumps back up to 100. It measures future expectations (three to six months) of small business owners based on how they feel about current market conditions, in an indication of economic sentiment. The report is based on the responses of 2,077 randomly sampled small businesses in NFIB’s membership, surveyed throughout the month of October The index gained 1.3 points, nudging it up to index up to 90.2, which is below the year-to-date average of 91.1 and only slightly better than the average since January 2009 of 89.1. As was the case in September, the gain in the index was primarily a result of less negative views about the prospects for real sales and business conditions — hardly the basis for strong economic growth. NFIB Chief Economist Bill Dunkelberg said consumer sentiment remains at depressed levels and is reflected in the 26% of small business owners who cite poor sales as their biggest problem. “There is no exuberance in spending, as consumers make do rather than spend their increased savings in upgrades or new purchases," Dunkelberg said. "It’s that extra spending that would provide small business owners a reason to hire and order more inventory, the best stimulus we could have. But confidence is the key and right now there isn’t much." “As for help from Washington, the Federal Reserve is out of bullets and Congress is completely ineffective," he added. "Fiscal policy is in disarray and all that is proposed is higher spending and more regulations and higher taxes to support it. Not the types of incentives that help stimulate economic growth.” In the report, 22% of all owners reported higher sales while 30% reported lower sales. The NFIB said this is not a level of economic activity that will support job creation. The net percent of owners expecting better business conditions in six months was a negative 16%, six points better than September, but still 26 points worse than January. The frequency of reported capital outlays over the past six months rose two points to 52%. The record low of 44% was reached in August 2010. The report states that over the next three months, 9% owners plan to increase employment (down 2 points from September), and 12% plan to reduce their workforce (unchanged), yielding a seasonally adjusted net of 3% of owners who plan to create new jobs. The net figure is down a point from September and two points below August, the strongest reading for 2011 to date. NFIB owners reported an overall reduction in employment for the fifth month in a row. Four percent of owners reported financing as their most important business problem, meaning that for the overwhelming majority, credit availability is not a significant problem. Ninety-one percent reported that all their credit needs were met or that they were not interested in borrowing. Nine percent reported that not all of their credit needs were satisfied — the record low is 4% reached in 2000. Write to Justin T. Hilley. Follow him on Twitter @JustinHilley.